Playwright, two-time Pulitzer Prize finalist, Tony Award nominee, and author, Sarah Ruhl will deliver a talk and signing of her recently released book, Letters from Max: A Book of Friendship. In 2012, Sarah Ruhl met Max Ritvo, a student in her playwriting class at Yale University, was an exuberant, opinionated, and highly gifted poet. He was also in remission from pediatric cancer. Over the next four years, in which Ritvo’s illness returned and his health declined, even as his productivity bloomed, the two exchanged letters that spark with urgency, humor, and the desire for connection. Reincarnation, books, the afterlife as an Amtrak quiet car, good soup: in Ruhl and Ritvo’s exchanges, all ideas are fair, nourishing game, shared and debated in a spirit of generosity and love. 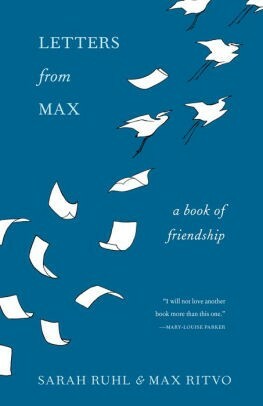 Studded with poems and songs, Letters from Max is a deeply moving portrait of a friendship, and a shimmering exploration of love, art, mortality, and the afterlife. Sarah Ruhl is a playwright, two-time Pulitzer Prize finalist, Tony Award nominee, and author of the book 100 Essays I Don’t Have Time to Write, which was a New York Times Notable Book of the Year. She has been the recipient of a MacArthur Fellowship, the Susan Smith Blackburn Prize, the Whiting Writers’ Award, the PEN/Laura Pels International Foundation for Theater Award for a midcareer playwright, and the Steinberg Award. She is currently on the faculty of the Yale School of Drama and lives in Brooklyn with her family. (Tentative snow date is Saturday, March 30, 2019 @ 11:00am).